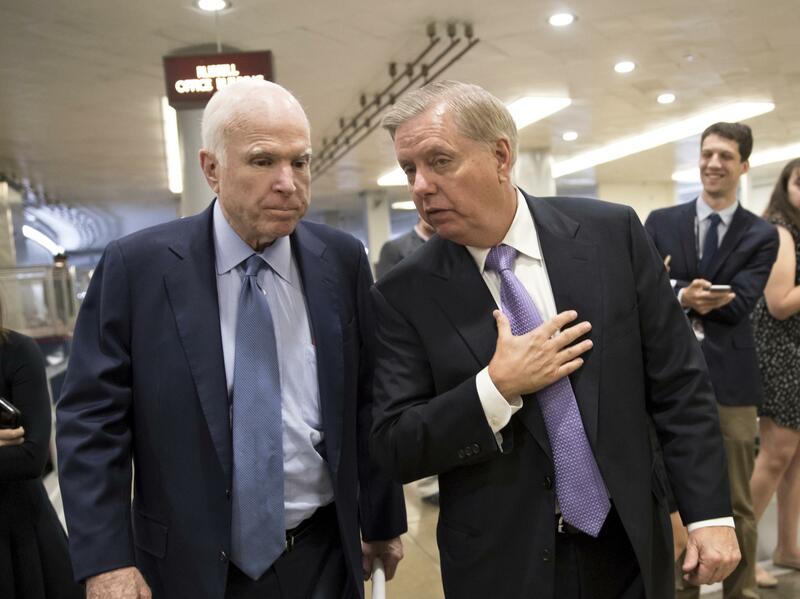 Sen. John McCain, R-Ariz., and Sen. Lindsey Graham, R-S.C., in the Capitol last October. The Arizona Republican this week came out in opposition to Gina Haspel, President Trump's CIA director nominee, who testified before the Senate intelligence committee on Wednesday. "Her refusal to acknowledge torture's immorality is disqualifying," McCain, the Senate's moral authority on the topic, said in a statement. "I believe the Senate should exercise its duty of advice and consent and reject this nomination." While McCain's opposition was not surprising, his call is affecting the calculation on whether her nomination can survive the Senate confirmation process. "He's the only one who's been through this," said Sen. Jeff Flake, R-Ariz., referencing McCain's time as a prisoner of war in Vietnam. Flake is undecided on Haspel and said McCain's position is weighing on his own decision-making. "I obviously share his views on torture and I always have so his views mean a lot," he said. Sen. Angus King, I-Maine, shares McCain's opposition to Haspel and said McCain is still able to make an impact from afar. "It may be if he were here personally, perhaps, he could be talking to some of his colleagues directly, but his statement was so clear it was hard to miss the point that he made," he said. Even senators who support Haspel's nomination, like Sen. John Kennedy, R-La., said he still takes McCain's point of view into account in this kind of debate. "Look, when John McCain talks, I listen. Sometimes I agree with him; sometimes I don't. But I always listen." Later this month, McCain's absence will also be felt on the Senate Armed Services Committee when it takes up McCain's prized jewel, the annual defense bill that sets the priorities for the Pentagon. McCain is the committee chairman, but he is not expected to return to shepherd the bill through the Senate. The top Democrat on the committee, Sen. Jack Reed of Rhode Island, said senators are moving forward in the same bipartisan manner on defense policy that McCain prides himself on as chairman. "Because of him, we're going to do our best to the job he would want us to do which is to make sure we can authorize legislation for the forces and do it in a bipartisan, principled way," Reed said. "He's a great personality. He's a great hero. He's somebody that we miss." McCain's health is a matter of constant speculation on Capitol Hill. One of his best friends, Sen. Lindsey Graham, R-S.C., spent two days in Arizona with him earlier this week. "He's stabilizing. Don't believe what you read in the paper. I was concerned when I went; I'm thinking now about my next trip. No talking about funerals," Graham told reporters. The end of the month is a politically sensitive deadline in Arizona. May 30 is a cutoff to have a special election this year if the Senate seat becomes vacant. After that date, the governor gets to appoint a senator to serve until a 2020 special election can be held. Graham tamped down on speculation that McCain's health could force him to resign soon, but he quipped that they weren't planning his re-election campaign either. "We're not at 2022 yet, but I'll let you know," he said. Instead, Graham described McCain as physically recovering and mentally intact, and he said that the two cracked wise during their recent visit while watching McCain's favorite movie. "If you want to figure out John McCain, watch The Man Who Shot Liberty Valance. That tells you all you need to know about me and him," Graham said. The Man Who Shot Liberty Valance is an old Western starring John Wayne and Jimmy Stewart. In it a legendary senator returns home for a funeral, and a reporter covering the story ultimately realizes the senator's career is built on a myth. But the senator has done so much good, the reporter tosses his notes in the fire — choosing not to destroy the image of a popular politician and telling him this: "When the legend becomes fact, print the legend." Far from the Senate floor, John McCain knows how to send a message.